In 4-quart Dutch oven, cook raspberries over medium heat 10 minutes, stirring frequently; cool slightly. Push through strainer with large spoon to remove seeds. Refrigerate raspberry juice at least 2 hours. 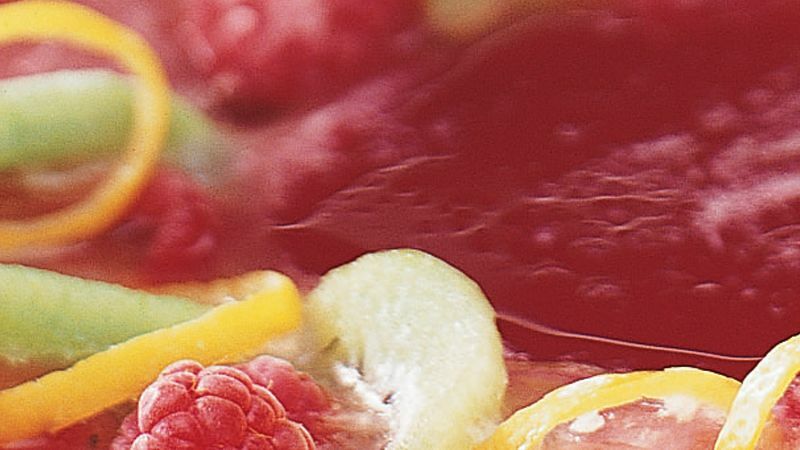 In punch bowl or large pitcher, mix raspberry juice and lemonade concentrate. Stir in ginger ale. Serve immediately over ice. An ice ring in a punch bowl will last longer than ice cubes. Be sure the size of the ice ring will fit the punch bowl. Want a special ice ring? Fill a ring mold with crushed ice. Arrange kiwifruit slices and raspberries in the ice so fruits stick up above the top of the mold. Freeze 15 minutes; add cold water or juice to fill mold. Freeze overnight or until solid. To remove, run hot water over bottom of mold to loosen.